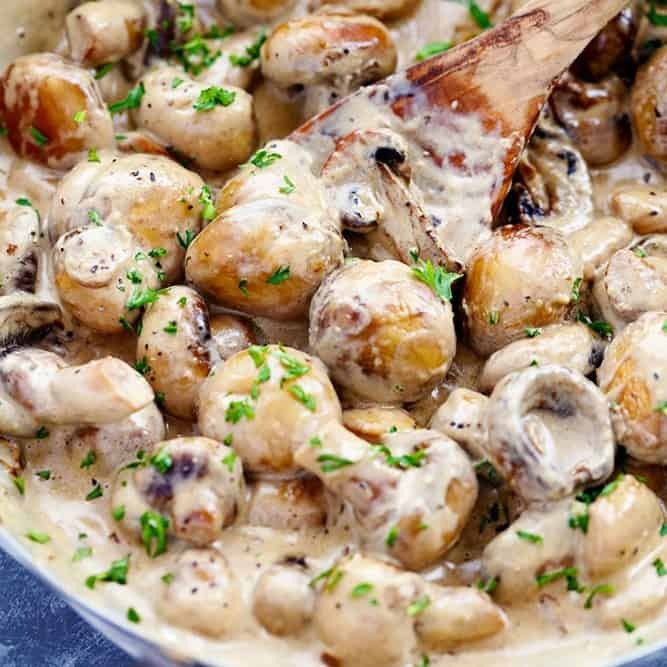 Creamy Garlic Parmesan Mushrooms are sautéed in a butter garlic until tender and then tossed in the most AMAZING creamy parmesan sauce. These are great as a side, on top of meat or eaten by themselves and ready in under 10 minutes! I am not the biggest mushroom fan in the world to be honest. Two things that I am not hugely fond of are mushrooms and shrimp. But my hubby loves both of them. So I have to cook both of those things every once in a while just to keep him happy. 🙂 But I have grown to like and eat both things and I especially love mushrooms if they are sautéed in a creamy sauce. These mushrooms have gotten me OBSESSED. They are the best mushrooms that you will ever eat! It begins with sautéing them in a butter and fresh minced garlic until it is tender. But then bring on the heavy cream and turn this dish into something fantastic! The heavy cream+parmesan+garlic+cream cheese…. This is a recipe for perfection! These make a delicious side dish. Or they are especially great on top of a steak or burger. Or you can literally gobble these done by themselves. Whatever you make them for you HAVE to make them! You guys are going to quickly agree that these are the best mushrooms you have ever had! I would be Tempted to add about 1/4 cup of marsala to the pan and scrape up the good stuff before adding the cream and Parma! Just saying…I always fiddle with recipes!! Got to try this. Thank You. Bookmarked! I’m gonna make this and eat it with garlic bread because who needs anything else with it! I prepared this dish for Labor day, wow it was so darn tasty. I just tasted it before serving with some bbq ribs, perfect side dish. I wonder if this would work as well with Alfredo sauce. Did you try it with the alfredo sauce? These things are absolutely delicious!!! Delicious!! I doubled the sauce recipe and added steamed green beans at the end for my non-mushroom eater. He raved that it tasted like something from a restaurant. My mushroom eater devoured everything on his plate and asked for me. A whole pound of mushrooms + double the sauce is a safe bet. Made the recipe today. Grilled entree. This was so easy, and delicious. Would be fabulous over grilled chicken, burgers, steak. The only thing I added was Morton’s season-all instead of salt & pepper. Loved the taste, but far too rich for me. Would maybe cut the cream with milk or use half and half. I also added fresh spinach, diced sautéed onions and sun dried tomatoes and served over pasta. Really, really good. Thanks! It wouldn’t let me rate. Would give 4 stars as is simply because of how rich the dish was. Tons of potential here though. Mix pasta in with these and it is amazing!! I adore mushrooms BUT would someone be so kind as to inform me what you intend by Italian seasoning? I have lived in Italy for 46 years and we do not have a mix like that in our supermarkets! You obviously do. I would like to know what’s in your mix because I could add all the herbs we have here, BUT, not all go together well! Tried to write to Pinterest but got no answer! That’s another question: how can I get in touch with them directly? Thank you for any help you can give. Hope everyone had a Merry Christmas and Happy new Year!!!!!! Hi, Linda! I share your annoyance at seeing any herb or spice mix referenced in a recipe because I never know what combination of flavors is being recommended, and every commercial mixture is different. My best advice: don’t worry about it! Use whatever combination of herbs/spices sounds good to you. For what it’s worth, here’s a suggestion from allrecipes.com: 2 tbsps. each dried oregano, thyme, marjoram and basil plus 1 tbsp. each of sage and rosemary. 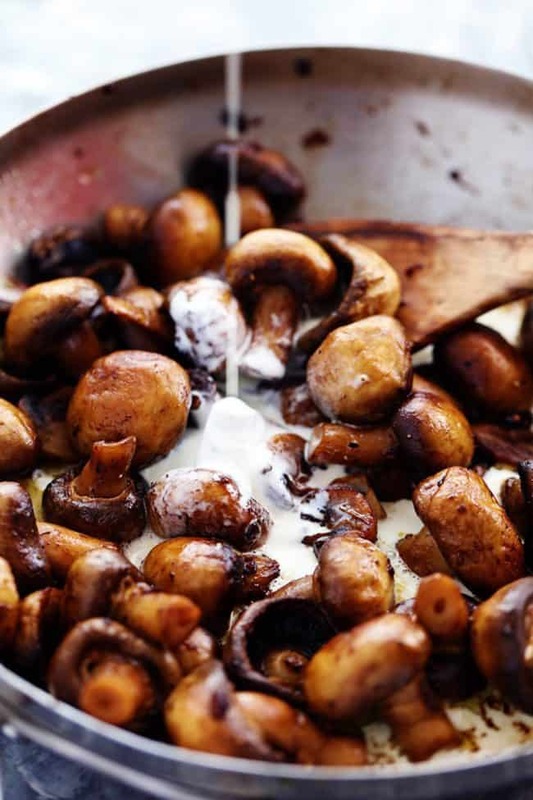 Personally, I think a mixture of tarragon, chervil and thyme would taste fantastic with this mushroom dish, plus a splash of brandy! It’s on my menu to go with steaks this evening and I’m sure it will taste wonderful with any fresh or dried herbs on hand, so thanks to the author for posting it. I hope this message reaches you and that you have a marvelous New Year. I found this on my jar of italian seasonings so I really don’t know how much of each ingredient to make the magic combination. This is AMAZING!! I will be making this very frequently!! I just made this recipe and it is excellent! Knowing that your hubby likes both mushrooms and shrimp…It inspired me to also try this recipe with shrimp. I’ll make the sauce first on a slightly lower heat. Once thickened, I’ll add large raw shrimp until just cooked through, as shrimp gets very tough if overcooked, and Sha-Zamm “Creamy, Garlic, Parmesan Prawns”!! Is this able to be made and put in a crock pot to bring to a get together? Just wondering if the sauce would hold up nice! Hi Brooke, Have you tried this in a crock pot? If so, I would love to know the details! I want to make this for thanksgiving, but the kitchen will be totally full where I’m going so a crock pot version is my only option. Thanks! That is great to hear! Thanks so much for your comment! I loved making this recipe! Glad it made a great meal for you :)! What a weirdo you are, sheesh. This recipe is blowin my mind right now. Great recipe. Bon appetit from Boston. Thanks Adam!! That is great to hear!! I am so glad you enjoyed it!! Thanks for comment!! Oh…my…GOD! I made this tonight and just poured it over some couscous. It was AMAZING. Seriously could have eaten the entire thing myself. Thanks for the delish recipe!!! Can the garlic parmesan mushrooms be reheated? Yes, I have reheated them the following day or even frozen them and warmed them up later on. Hope that helps!! 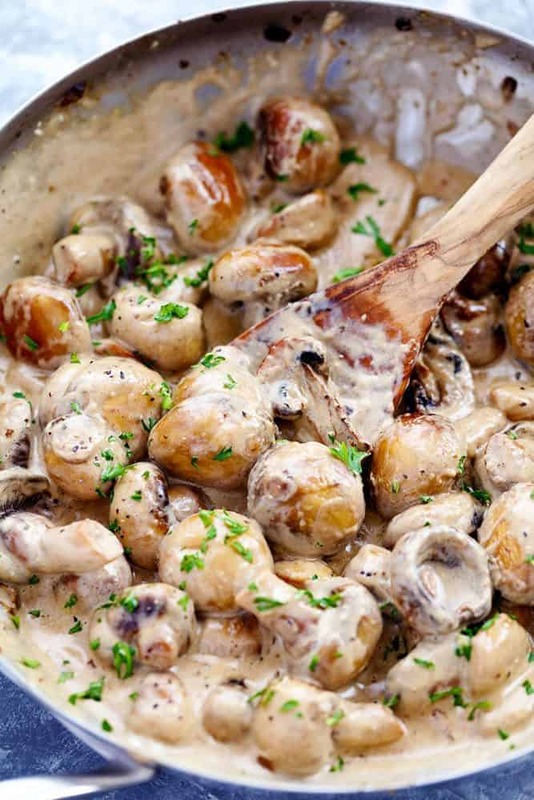 Loved this mushroom recipe! One thing I added as an extra was to fry a chopped red onion before sautéing the mushrooms. I also used a combination of button mushrooms and chestnut mushrooms for a deeper earthy flavour. My girlfriend and myself loved it. Replace cream cheese with Gorgonzola. Yum. 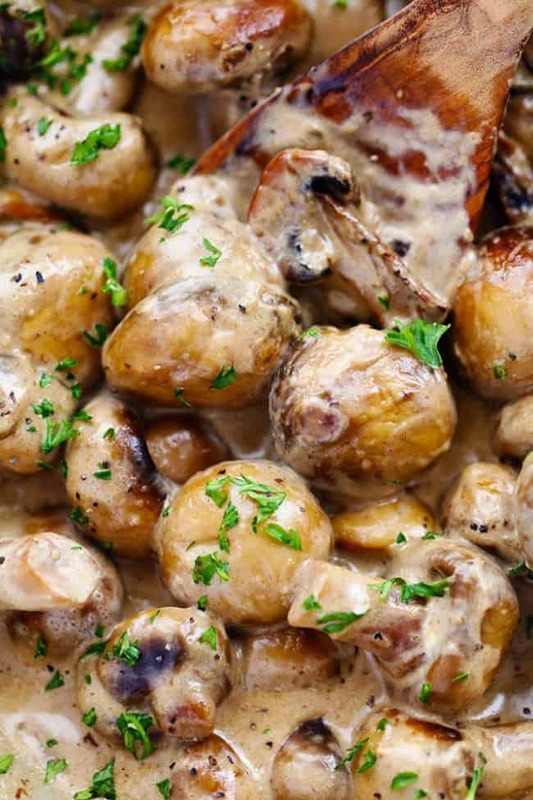 These mushrooms sound amazing and will be tried at the first opportunity. Many thanks. Will report back. Greetings from Sunny South Africa, Cape Town. Oh my! I just made the creamy garlic parm mushrooms for dinner! I ended up using them on my meatloaf like gravy. I stopped short of licking my plate! My husband and I started talking about what else it could end up as…poured over asparagus, or with chicken and onions, or as a killer base for beef stroganoff! It was in my Thanksgiving meal ideas, but we started being thankful a few days early! Yum!! I tried to give 5 stars but the site wouldn’t register 5! I made those with baked garlic potatoes and it was delicious! Next time I will try to pour it over a soya steak or burger. Absolutely delicious! Even my mushroom hating husband said they were good. Quick and easy, too. Amazing!!! Exactly what I was hoping for! I put it on my chicken breast and it was fantastic. I’ll be making this again soon! I don’t have any dry Italian seasoning mix. Can I use a little bottled Italian? Was so wanting to cook this for dinner tonight!!! Going to try this tomorrow for dinner. Wondering how it will taste with Shrimps n a little spinach. Your such a blessing!!! My husband is so in love with olive garden creamy mushroom were we spend so much money. 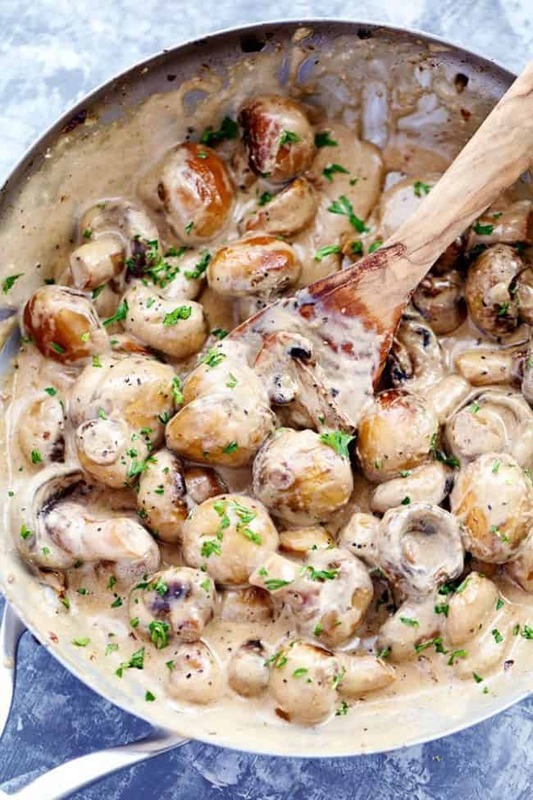 After trying some creamy mushroom on pinterest I always ended up not getting the exact taste, well my husband is really honest on criticizing the food. After a long searched your recipe is the exact, perfect, more delicious than his favorite and he ask me to make it every now and then. The video clip also helped me too see your right procedure of throwing the ingredients by each step. I am glady happy you made this, and I made sure I did followed it right measurement. Will be saving this recipe for sure. I am sure you had helped many housewife there like me ?. Many thanks. God bless. Looks so YUMMY. Am going to try the keto dirt, love the looks of these mushrooms. This looks SO delicious. I want to make it for Thanksgiving in a Crock Pot. Do you think this will work? Made exactly as described and it turned out absolutely amazing! Tossed with spaghetti for the most amazing pasta dish I’ve ever had. Tried this tonight for the first time. Gonna make a few tweaks for next time, I think I may have over salted… but it was awesome. This would be a good low carb side dish. Any idea how many carbs?